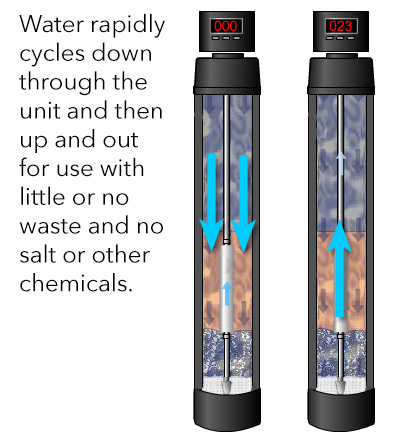 The Filtercon Home Filtration System uses patented Hydromagnetic Technology. This non-chemical conditioning conveniently provides a crisp, clean feel to the water throughout the home from every faucet and shower. What is inside Filtercon Fresh Family Water Filter System Cylinder? Automated Backrinse Control - Totally computerized automated performance valve. Stage One - Up to 2.5 cubic feet (69 lbs) of high grade activated granular carbon. Hydromagnetic Module - The patented Hydromagnetic module conditions the water non-chemically by restructuring and realigning the polarity of the mineral molecules without removing healthy minerals from the water. Stage Two - Up to 20 lbs of Quartz (nature's own filtration). Stage Three - K.D.F. 55 Medium consisting of high purity granules. The beautiful shiny outer tank is made of polished stainless steel. The inner tank consists of a Poly Glass pressure tank to hold water and media without imparting flavors. This durable and attractive system may be installed indoors or out (climate permitting). We have a variety of customized systems for both commercial and residential needs. Tim and Lisa of Carlsbad. Tim is a technical sales consultant and Lisa is an educator. They have had our Filtercon system in their homes for over 10 years. Back washing or regeneration is the process of cleaning the filtration beds on a regular basis. This is what extends the life of our system so long, saving our customers a lot of money long term. Our computerized systems perform this function automatically. There is nothing for the home owner to do except drink Filtercon Fresh Water from every faucet in the house.